The insults have becoming increasingly personal, but they don’t always work. The insults have been flying thick and fast. Malcolm Turnbull is “Mr Harbourside Mansion”, “Top Hat” Malcolm, “the slick merchant banker”, “the top end of town” man. It is a measure of the unhappiness in the Coalition that not all of these epithets were invented by Labor. Meanwhile, Bill Shorten is, according to Turnbull, a “sycophant”, a “groveller”, a “man who abandoned workers” while he “tucked his knees under” the table of billionaires like the late businessman Richard Pratt. The red faces, raised voices and flying spittle that accompany the parliamentary trade in insults are meant to convey passion and spontaneity. But we can be confident the lines have been sorted well in advance. Turnbull’s insults, for example, made in parliament just recently, largely repeat things he said in February last year when he called Shorten “a social-climbing sycophant” and “would-be tribune of the people”. On the other side, Labor has been seeking to present Turnbull as an out-of-touch Sydney snob from the day he took office. Do such insults work? We know from the research of Australian political scientists – such as my colleagues here at the Australian National University who produce the Australian Election Study – that elections have become increasingly personalised. Most voters do not comb through policy documents. Rather, they use the party leader as a means of making judgments about the things that matter to them. So, the Labor Party hopes that, if it can make enough mud stick to Turnbull, it can present him as unqualified to make decisions about the welfare of ordinary people. Being so rich, they suggest, he is out of touch with their concerns. The Coalition hopes that if it can make its mud stick, Shorten will be seen as a self-serving opportunist who built a union and political career by taking advantage of the workers he was supposed to represent. There is nothing new here; the appeal on each side is a traditional one. Labor cartoonists of a previous era would often draw Mr Fat – an obese capitalist – complete with top hat, tails and cigar, the very embodiment of greed and excess. They would sometimes set him beside a brawny, manly worker determined to resist his wiles. Phil May, ‘Poverty and Wealth; It all depends on the position of the bundle’, Bulletin, c. 1887. The anti-Labor images of the union boss as a parasite on the working man, and of the Labor politician as self-serving careerist, have existed as long as the Labor Party itself. Paul Keating’s question about an Andrew Peacock leadership comeback – “Can a soufflé rise twice?” – was perfect in every way, as was his designation of Liberal leader John Hewson, “the feral abacus”. But Keating’s quips went down better with the press gallery and the intelligentsia than the ordinary punter, and he had to endure insinuations that an enthusiast for Italian suits and French clocks could not be a true Labor man. Bob Hawke, more than Shorten, acquired a large coterie of “close personal friends” among the rich and the filthy rich. But this was probably an advantage in his early days as prime minister, when he talked of consensus between workers and bosses in the national interest. As the feeling developed that his friends were doing very nicely while most others were doing it tough, the term “rich Labor mates” became shorthand for the idea that Hawke and Keating had sold out the workers. Hawke was “the silver bodgie”, a reference to the colour of his still luxuriant hair, somewhat like that of a 1950s “bodgie”, a stylish youth somewhat in the James Dean mould. But some of our political leaders have had nicknames that were more distinctly pejorative. The Sydney Bulletin called Australia’s first prime minister, Edmund Barton, “Toby Tosspot”: he had been known as “Toby” much of his life and a “tosspot” was a vulgar term for an enthusiastic drinker. “Affable Alfred”, for Deakin, was affectionate but could be used by opponents sarcastically when he wasn’t being quite so affable. “Jolly John”, for John Gorton, sounds affectionate, until you recall that it was a reference to his erratic personal behaviour. “Honest John” – for Howard – was mainly used ironically rather than descriptively. But Howard’s own claim that Kim Beazley lacked “ticker” is usually seen as having worked on voters looking for strong leadership and doubtful the Labor opposition leader could provide it. Robert Menzies’ critics on the left called him “Pig Iron Bob” after his role, as a member of the Lyons government, in opposing union bans on the shipping of pig iron to Japan. The epithet, which stuck throughout his long career, was intended to remind people of Menzies’ poor judgment and association with the policy of appeasement of the Axis powers. It was a potent rhetorical weapon during the 1940s and even became the subject of radical folksong but, as the years of his prime ministership rolled on after the war, it seemed to do him no obvious harm. Highly personal assaults can backfire badly. The best example from Australian politics is Country Party leader Earle Page’s savage attack on Menzies in 1939 for failing to enlist in the first world war. Menzies had wanted to serve but already had brothers at the front, so remained behind as the result of a family decision. Page’s career never recovered from the disgust that his attack induced. That didn’t stop the mischievous Labor firebrand, Eddie Ward, from later joking that Menzies’ brilliant military career had been cut short by the war. It’s a tough place, the federal parliament. In this piece we look at the need for personal income tax cuts. A large proportion of any cut in personal income tax – especially if the cuts were skewed towards lower and middle-income households with a higher propensity to spend – would likely provide a greater direct stimulus to the Australian economy than an equivalent cut in company tax. Cutting personal income taxes seems likely to provide much more of a boost to the Australian economy than cutting company income tax. As the government’s own published modelling shows, the benefits of its proposed cuts to the company income tax rate are small relative to their cost. Do we need income tax cuts to provide relief from financial hardship? The treasurer and I have been working on how we can provide more tax relief for hard-working middle income Australian families. Over the last five years, household spending has grown by just 2.6% per annum in real terms, on average – of which more than half has been the result of population growth – compared with an average of 3.6% per annum over the preceding 12 years. Even with that lower growth rate in their spending, households have reduced their saving rate, from around 7% of disposable income five years ago to around 2.5% in 2017. That’s the lowest saving rate since before the financial crisis. The key reason for this “squeeze” on household spending and saving is of course the ongoing weakness in the growth rate of household disposable income. Over the past five years, real per capita household disposable income has grown at an average annual rate of just 0.4%, compared with an average of 2.6% per annum over the preceding 12 years. One reason for this is that Australian households have been paying an increasing proportion of their income in taxes. In the years prior to the onset of the financial crisis, almost every budget included personal income tax cuts in some form or other. By contrast, there have been no changes to Australia’s personal income tax scale since 2008 – apart from the increase in the tax-free threshold (paid for by an increase in the bottom rate) in 2012, the temporary surcharge on top-rate taxpayers which applied between 2014-15 and 2016-17, and the increase in the threshold for the second-top rate (from A$80,000 to A$87,000) which took effect in the 2016-17 financial year. As a result, in 2017, Australian households in aggregate paid 19.5% of their taxable incomes in income and other direct taxes – the highest proportion since 2005, and continuing a steady rise since 2011. Households are also spending almost two and a quarter percentage points more of their after-tax disposable incomes on education, health, insurance and other financial services, and utilities than they did five years ago. Given all this, it’s little wonder that household spending in more “discretionary” areas has been so weak in recent years. Well-targeted personal income tax cuts could thus help to ameliorate this multi-faceted “squeeze” on household incomes, and provide a direct boost to the economy. Do we need income tax cuts to make up for the fact that we haven’t had a pay rise in a while? It’s been a long time since any Australians had a decent pay rise…this is a real pressure on Australians…we can give them some relief when it comes to their personal income tax. The other major reason for the very slow growth in real household disposable income over the past few years has been the unprecedented slowdown in wages growth. Wages have risen at an average annual rate of just 2.2% over the past five years (only 0.3 of a percentage point above the inflation rate), down from 3.7% per annum over the preceding 12 years. Although, as RBA Governor Phillip Lowe noted in a speech that “the latest data suggest that the rate of wages growth has now troughed”, he went on to warn that the pickup which the RBA expects “is likely to be only gradual”. Recent experience in other advanced economies clearly suggests that the unemployment rate needs to be lower for longer than in previous business cycles before wages growth starts to pick up. So even assuming that Governor Lowe is right, it may be one or two years before Australian households can expect any meaningful improvement in their financial position from faster growth in their wages or salaries. Well targeted personal income tax cuts could help provide at least some offset to this likely continuing stagnation in wages growth over the next year or so. Targeted personal income tax cuts could reduce the squeeze on households and make up for persistent low wages. Of course, it remains crucial that any cuts in personal income tax be sustainable – that is, that they are not funded by bigger deficits, and do not materially detract from the task of putting the nation’s public finances on a sounder footing. This is so we are better placed to withstand any unforeseen economic shocks. And it’s important to remember that government spending has moved to what appears to be a permanently higher level as a proportion of GDP since the financial crisis. The government’s underlying cash payments averaged 25% of GDP from 2011-12 through 2017-18, up from 24% from 2001-02 through 2007-08. That also represents a constraint on the scope for tax cuts. However, the apparently greater improvement in the budget so far this financial year, compared with what was forecast as recently as last December’s Mid-Year Economic and Fiscal Outlook, could give the government a little more latitude for financially sustainable personal income tax cuts in the upcoming budget. Perhaps the most sustainable way of providing the “relief” which the treasurer says many Australian households need, would be to abandon the tax cut for companies turning over more than A$50 million a year. The government hasn’t been able to get these through the Senate. These cuts would do far less to boost the Australian economy than well-targeted personal income tax cuts of a similar order of magnitude. In Russia and China, Donald Trump now faces two centres of power that are no longer willing or feel the need to comply with America’s interests and priorities. Alarm bells are ringing a mere three months into Donald Trump’s presidency. The two global flashpoints, Syria and North Korea, are worrying enough. More troubling still are America’s relations with Russia and China. These are now mired in angst, uncertainty and mutual suspicion. They underlie the failure to create a viable system of crisis prevention and crisis management. Trump’s first 100 days as president have dramatically demonstrated this failure. For all the rhetoric about “making America great again”, Trump is rapidly discovering that the US has limited capacity to impose its will on the rest of world. The trend is visible everywhere – in international trade and finance, diplomacy, and numerous conflicts around the world. 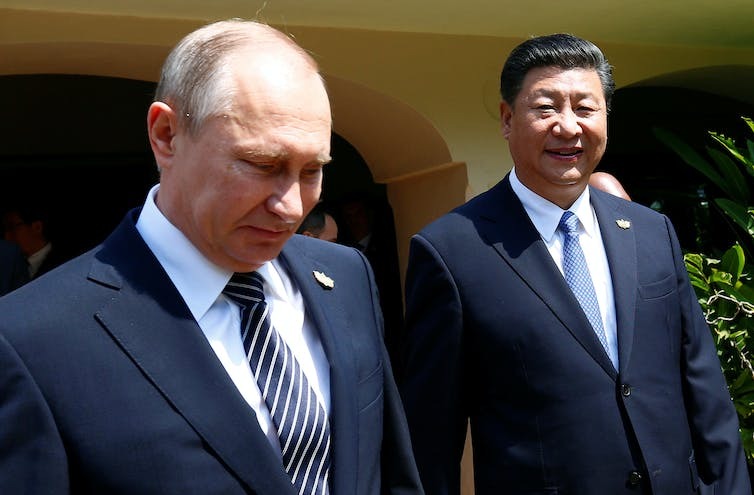 In Russia and China, the US now faces two centres of power that are no longer willing to comply with America’s interests and priorities. Under Vladimir Putin, Russia has been busy reasserting its influence after years of humiliation following the break-up of the Soviet Union. Starting from a low base, China has sustained over the last three decades the most remarkable rate of economic growth in modern history. Now it is seeking to exert the political influence commensurate with its new economic status. America’s relative political decline goes back to its military defeat in Vietnam. Temporarily obscured by the end of the Cold War, it became fully apparent during the Bush and Obama years. But Trump is the first president to have run on a platform openly stating that the US is in decline and promising to reverse the trend. The nationalist card – the one unifying plank of his otherwise chaotic discourse before and since his election – is meant to strike a chord with the many disenchanted Americans hankering for a “golden age” that has long since passed. Trump now faces the immense challenge of delivering on this pledge despite intractable problems at home and abroad. On the international stage, he has chosen to rely on showing off America’s unmatched military might. This position is supported by some of the most powerful voices in the US military and political establishment. Soon after taking office, Trump gave the military expanded authority in the conduct of operations against Islamic State in Syria, Iraq and elsewhere. In support of the Saudi bombing campaign against Houthi forces in Yemen, the US carried out 70 airstrikes in March alone. This is more than twice the number for all of 2016.
threatened military action against North Korea. Yet the utility of military power is diminishing. As one centre of power declines and another rises, new faultlines and tensions emerge, and with them new uncertainties. This helps explain why the US finds it so difficult to set a clear policy direction for relations with Russia and China. In the case of Russia, Trump’s task has been greatly complicated by the findings of the US intelligence community that the Russian government interfered in the 2016 US election. Hoping to deflect attention from his campaign’s links with Russia, Trump has allowed relations with Russia to continue on their downward slide. Perhaps it was never his intention to reset the US-Russia relationship. In any case, he is under considerable pressure from his most senior security advisers to act tough with Russia. Almost certainly, he failed to appreciate that his actions and statements on Syria would provoke Putin’s fury. The end result is clear. In Trump’s words, US relations with Russia have reached “an all-time low”. Not surprisingly, he has now reversed his previous position on NATO, and announced the alliance is “no longer obsolete”. Russia, for its part, remains unbending in its support of the Assad government in Syria. It has mercilessly denounced the illegality of the US missile attack, and used its veto power to block a UN Security Council resolution condemning Syrian President Bashar al-Assad for his use of chemical weapons. And now Russia has forced the US to accept a significant watering down of the UN Security Council resolution condemning North Korea’s latest missile launch. Russia has been busy reasserting its global influence under the leadership of Vladimir Putin (left). 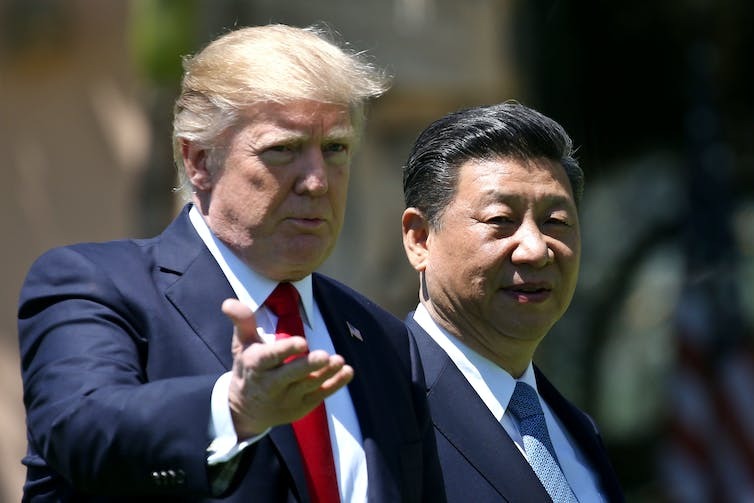 During his election campaign, Trump repeatedly lambasted China for its currency manipulation and threatened to apply tough restrictions on Chinese exports. Before and immediately after his election he flaunted America’s commitment to Taiwan’s security, and challenged China’s military build-up in the South China Sea. Yet the tone has since changed markedly. Chinese President Xi Jinping’s visit to the US became an occasion to discuss differences on trade and agree to a 100-day plan for reducing the current US trade deficit with China. At least in public, Xi stuck to his script about the virtues of bilateral co-operation. Trump presented the talks as forming the basis for “an outstanding relationship”. The North Korea crisis has exposed the limits of US power. Neither increased US economic sanctions nor the threat of military action are likely to force the North Korean regime into submission. The US needs China’s help to have any chance of reining in North Korea’s nuclear ambitions. China’s response has been to increase pressure on North Korea while issuing a stern warning to both parties. And so, the relationship remains at best unpredictable. As much as China and the US need each other, the hawks in the Trump administration – and there are many – will not easily abandon their plans to contain China, challenge its claims to sovereignty in the South China Sea, and maintain the US military’s pre-eminence in the region. However, none of this will halt China’s rise. The months ahead are less than promising. The use and threat of force will do nothing to resolve any of the longstanding conflicts in the Middle East or east Asia. The projection of military muscle and modernisation of nuclear arsenals are far more likely to produce greater local and regional instability, and heighten the risk of miscalculation from any of the three major centres of power. Trump and Putin lead countries that hold some 14,000 nuclear weapons, or close to 95% of global stockpiles. These arsenals cast a shadow over US-Russian security, which seems likely to darken with the advent of new technologies and rising levels of mistrust and suspicion. Pursuing “America First” or “Russia First” policies in conditions of such mutual vulnerability is an exercise in futility. A more profitable course for these three centres of power is to recognise each other’s legitimate interests, expand the opportunities for economic and diplomatic co-operation, and develop a co-ordinated approach in the management of actual and potential flashpoints. To bear fruit, such efforts need to have solid foundations – in particular decisive steps to eliminate nuclear weapons, enhance the effectiveness of international law, and strengthen the UN’s capacity for conflict management and peace-building. Professor Camilleri will explore these issues in depth at a keynote lecture to be delivered at St Michael’s on Collins, Melbourne, on May 9 and 16.